Frank (Louis) Placak, a brewer, and his wife Katherine, immigrants from Austria are now 48 and 38 years of age [10 years difference] have been married 19 years and have 7 children. Daughter Bertha is 18 runs a machine at a box factory; Son Joseph is 15 and a helper at a sewing machine company; Frank is 14; Daughter Mary is 12, Pauline is 10, Son James is 8. There is a girl Anna, a store saleslady, with the family, but uncertain of relationship and age. Louis Placak, 53 in 1920, immigrated from Austria/Bohemia to the United States in 1901 at about age 34 and was naturalized in 1905, as was his entire family at that time - his wife Katherine (46) [7 years difference! ], daughter Birdie (27) Joseph (25), Frank (23) and Pauline (18). All of the family except the two boys James and Norman were born in Bohemia and they all spoke Bohemian. James and Normal were born in Ohio and James was 16, but Norman was a bit under age 5 in 1920. Louis was a laborer for an auto company and he did not speak English; neither did Katherine. Birdie was a machine operator at a safety pin factory (Wow! ), Joseph was a machinist at an auto manufacturer, Frank was a tinner at a sheet metal company, Pauline was a department store saleslady, James at 16 was a bookkeeper at a bank. All the children in this family could speak English! 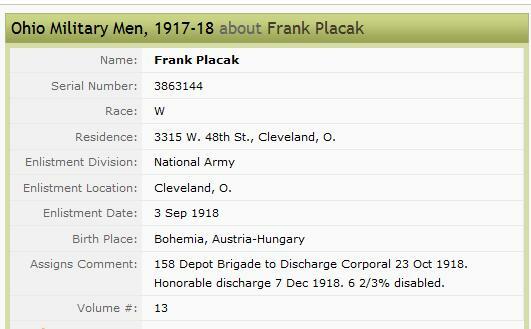 Per his WWI Draft Registration Card, Frank lived in Cleveland at 3315 W. 48th Street. He was born October 10, 1896 in Bohemia, Austria-Hungary. He was 21 and not employed. His right hand middle finger is listed as smashed. He has light brown hair and eyes. 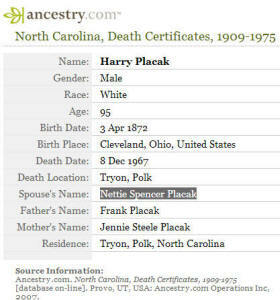 His father is listed as Louis Placak, of the same residence. 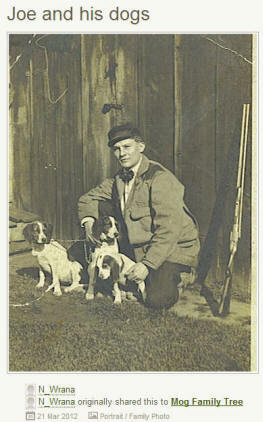 On the 3rd of September in 1918, Frank enlisted in the Army at Cleveland for WWI. Frank was "158 Depot Brigade to Discharge Corporal 23 Oct 1918. Honorable discharge 7 Dec 1918. 6 2/3% disabled." 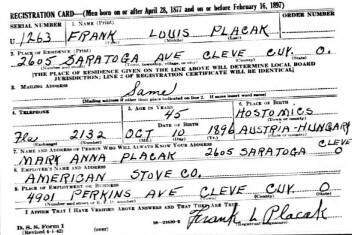 Per his WWII Draft Registration Card, Frank LOUIS Placak lived in Cleveland at 2605 Saratoga Ave. He was now 45, being born on October 10, 1896 in "Hostomics", Austria- Hungary. 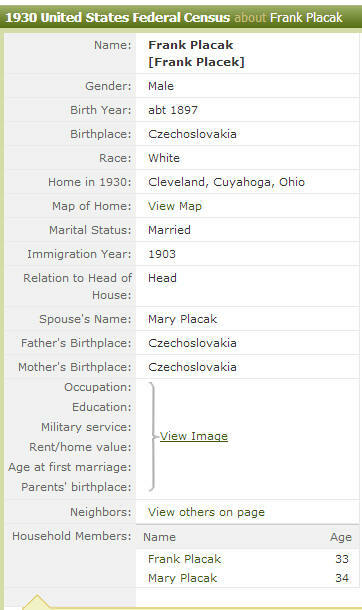 He is living with Mary Anna Placak (wife?) and is working for American Stove Co., 4901 Perkins Avenue, Cleveland. Thanks to Sandra at Lupica Family Tree for the above picture. Per http://aad.archives.gov/aad/record-detail.jsp?dt=2153&rid=30807&dl=1297: Harry was a member of the American Chemical Society. 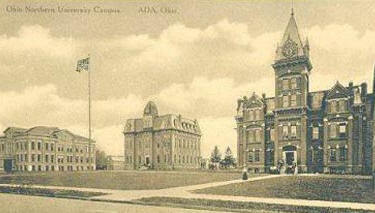 He had a "masked value" selective service classification, and he had a Bachelor's Degree in Pharmacy fr om Ohio Northern University, in Ada, OH, 1895. Nettie died in Cuyahoga, Oh on 23 Mar 1925. 1) Reginald Spencer Placak born June 12, 1900 in Ohio, who married Grace "Susan" Linkerson who had an out-of-wedlock only child, daughter Dorothy Linkerson. Grace's father was extremely stern and Grace left home to raise her daughter on her own in Cleveland. Grace went on a double date and ended up marrying the date of her friend, Reginald Placak, who adopted Dorothy. Ancestry's contributor, DIANEMISIOLEK, stated that Reginald was "the most wonderful father and husband. I loved my Grandmother Grace, but she was a VERY TUFF old cookie (Hungarian) and sometimes I don't know how he dealt with Grace. They had the old fashion kind of love and they lived a very Happy Life! They were still holding hands in their 80s." 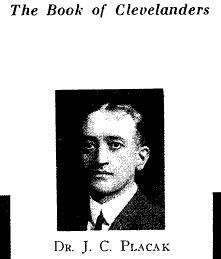 Reginald worked for Standard Oil Company in Cleveland, OH. He read daily, including the bible. Reginald began losing his eyesight in his 30s and had to retire due to that. Ultimately, he became blind. " He would feel our faces and could tell if I gained any weight, by touching my arm. So kind he was. When Grandmother passed away. I moved in with him and fixed up the house and made it very nice for him. New furniture, etc. He really enjoyed my children and being with us every day. He lived a healthy life until 1993 and passed at home peacefully." Per Ancestry's contributor, DIANEMISIOLEK. 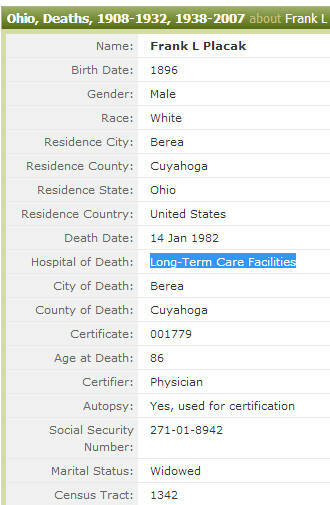 He died quietly at home" at 19513 Lunn Road, Strongsville, Cuyahoga, Ohio on February 7, 1993. In the Cleveland OH 1920 Census Reginald is married to Nettie who is 46 and he is listed as 52. All three children are living with them. Reginald is listed as born in Bohemia! Nettie in NY, and kids in Ohio. Reginald is a chemist for a pharmaceutical company. 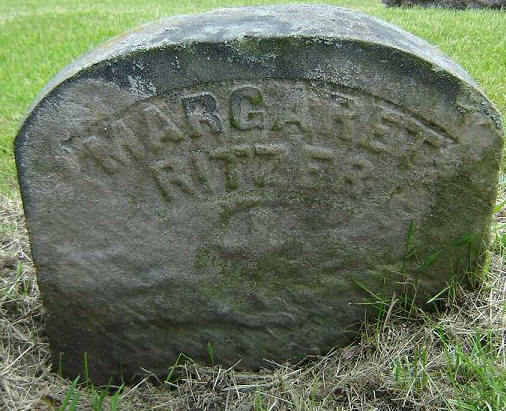 In the Parma, OH 1930 Census Reginald was a widower at age 58 and living with his children, Harriett, 21, and Oliver R. Placak, 23 in a $13,000 home. Reginald was a chemist for Grain Elevator and Oliver a chemist for Acidworks. Harriett was a stenographer. 3) Harriet Placak born about 1909, also in Ohio. 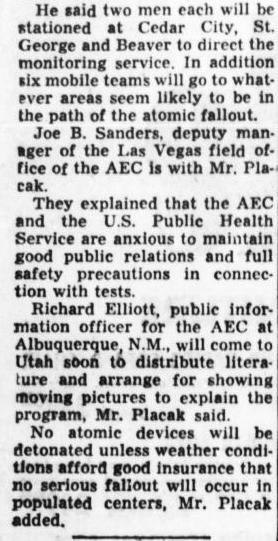 This is the obituary for Harry Placak, who died at age 96 on December 8th, 1967. 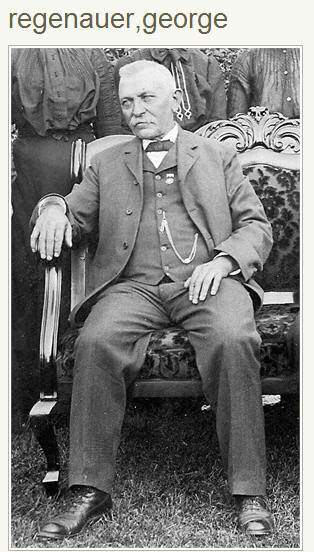 He had been a prominent pharmaceutical chemist from Ohio who retired to Tryon 27 years before his death. He died at St. Luke's Hospital after having broken his hip in a fall. Dr. Harry Placak had a home with a lab on Skyuka Road where he did research even during his retirement. Dr. Harry was survived by his daughter Harriet Wolff of Cleveland, son Oliver R. Placak of Las Vegas, and Reginald Placak of Cleveland. McFarland Funeral Home in Tryon handled funeral arrangements. Harry is buried in Cleveland, OH, Riverside Cemetery. 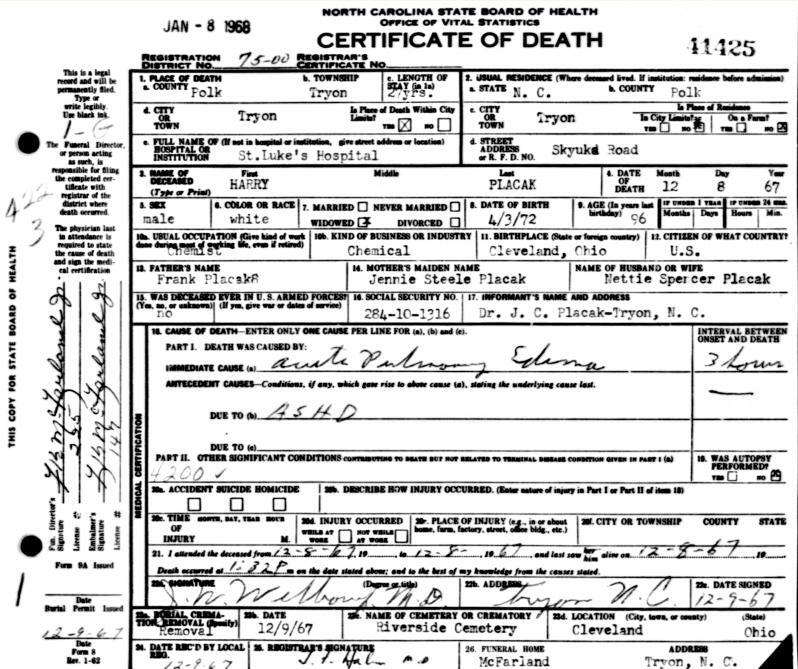 To see his death certificate, click on appropriate blue box in right hand column. 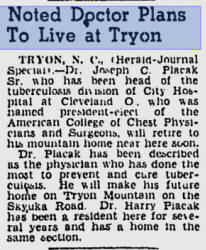 moved to Tryon in 1948 and also resided on Skyuka Road. 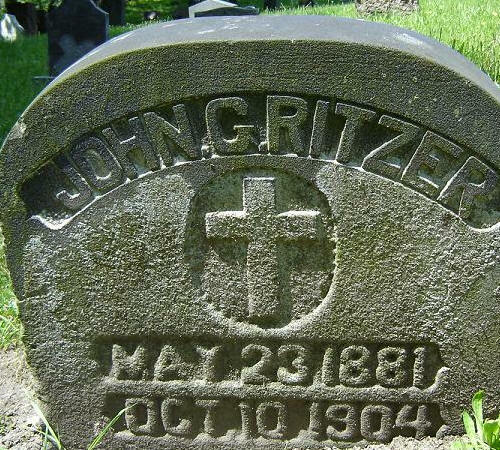 He is reputed to "have done the most to prevent and cure tuberculosis"
Grandparents: Joseph Regenauer from Germany in 1865 and Regina Gensert who also immigrated from Germany. 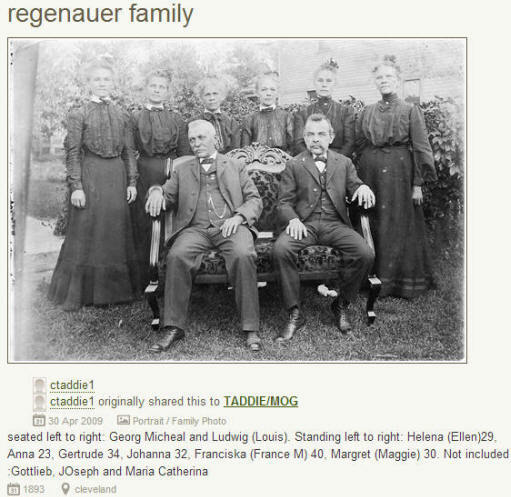 Great Grandparents: Georg Michael Regenauer from Germany and Barbara Eva Schotthofer from Germany. In the1930 Census, Oliver worked as a chemist as an acid works. He and his sister Harriet J. Placak were living with their father. Dad Harry owned a home worked $13,000, and worked as a chemist for a grain elevator company. Harriet was a stenographer at the same company. Oliver and Genevieve had two sons. In 1940 they rented a home for $40 a month located at 3424 Cardiff Avenue in Cincinnati, OH. Oliver lived in Las Vegas at least from 1978 through 2004. 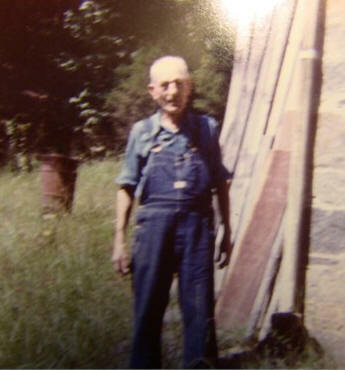 Per the SSDI, Oliver Placak was born 21 March 1906 and died in September of 1985 in Nevada at the age of 79. Oliver also worked at the Oak Ridge National Laboratory and worked on decontamination of radioactive waste and water-treatment processes. See Google Books: Laboratory design for handling radioactive materials by National Research Council (U.S.). Building Research Advisory Board. This PDF document shares a lot of information on the Nevada Flats testing and on Oliver Placak, who was nicknamed "Ollie." Page 24: "But the one thing about Mr. Placak particularly, his great pride is in how he was able to develop people." "And so I learned as much about management, although he was a very laissez-faire manager. And people that needed direct supervision couldn’t handle it. A lot of people disliked him immensely but I adored him because he really did give me a lot of information and taught me a lot of things, good things, I think, because I think it’s extremely important, to the people that you have working for you. " "Actually the biggest protest that happened during the time, the start of the protests, was probably on Plowshare. They were going to do a test in Grand Junction, and there was a group of protesters that sat on ground zero and they wouldn’t move. 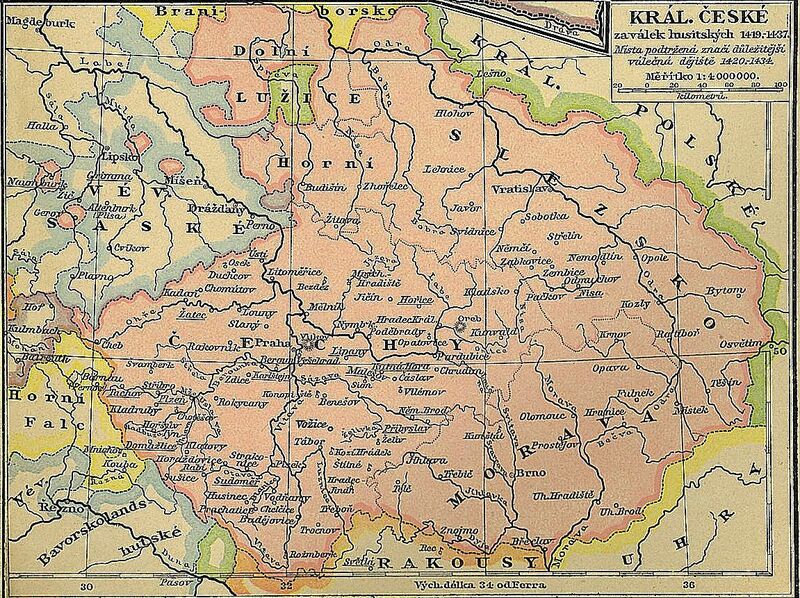 "Yes, and so I know that Placak and Mel Carter, his deputy—Mel went up there and Placak stayed in town. They were very concerned and they tried their darndest to get those people out of there, and they finally just told them, If you don’t go, we’re going to blow anyway. "That was, oh gosh, probably in the late 1950s or early 1960s. Frank Matthew Ritzer WWI Draft Reg Card: Mrs. Genevieve Ritzer Placak (Oliver) father. Copyright ©2010-2015. All Rights Reserved.